November is National Adoption Month, and my sweet friend Joy was so gracious in asking me to write on a topic so near and dear to our heart, adoption. I want to begin by thanking Joy for taking the time to discuss a topic that is so dear to our Father’s heart and for allowing us to tell our story. Our story begins in 1995, when at age 18 I was diagnosed with a 14 lb tumor in one of my ovaries. The tumor was removed immediately, but left a great deal of scar tissue, which we found out years later, left me with a less than 5% chance to conceive a child naturally. The Lord used this difficult time to work in both of our hearts. God was teaching me that I needed to relinquish my desire to control when I wanted children in our family. Fonsie, my husband, was not open to adoption, but over the next several months, the Lord showed him that the purpose of having children is to have an opportunity to love another human being; and if that is the case, then it does not matter if your child is biologically related to you. At that point, we knew that God was calling us to adopt. At that time, my husband was finishing up graduate school, so we waited to start the process, not wanting our imminent move to cause any disruptions in our adoption process. In the fall of 2004, we moved to Indiana and immediately began to work with our agency and assemble paperwork. In the beginning, we were all over the place; trying to figure out which direction the Lord was leading (twins? Sibling group?) but we knew for sure we would be adopting from the Philippines. However, one night in our living room, Fonsie had an amazing experience with the Lord, through which the Lord impressed deeply on Fonsie’s mind and heart that we were to adopt the most unwanted child that we could find, as a picture of the gospel. Christ adopts us when we are in sin, when we are so unwanted…but not unwanted by God. So I called our coordinator and began to speak with them about the hardest children to place. Sibling groups and older children are difficult to place she told me; however, children with special needs were the most difficult. Her exact words were “No one ever wants to adopt them.” Having been trained in special education that was not a terribly shocking statement to me. Prior to this conversation, and Fonsie’s encounter with the Lord, I had looked on our adoption agencies website and had seen information about a little boy which stated “Angel, 2 years old, congenital cataract”. There is no reason that information should have stuck with me, but it did. Sure enough, the agency was more than happy to send us Angel’s information. I tore through it and cried, the hard beautiful cry, knowing, this was my child. Fonsie never looked at it, telling me he didn’t have to, this was our son. We suspected based on pictures that were sent, that Angel might have autism, but it was never confirmed before meeting him. The day we flew to Legazpi to get Angel, we were told right before boarding the plane, that they suspected a hearing loss. For about a minute, I could feel my heart in my feet, but I trusted the Lord. I cannot possibly describe the first moments that I saw my sweet boy, toddling down the hall to me…after waiting for 6 years since first trying to conceive, I was about to hold my son. He was so tiny…at 4 years old he weighed just 19lbs and was in 18-24 month old clothes. He did not know how to chew food; he drank from a bottle, and was in diapers. We would find out later that he would receive the diagnosis of Deaf Blind autistic. I could not begin to imagine how much the Lord would teach us and those around us through our son. The next few years held many surgeries, many diagnoses, and many cries out to the Lord for help in raising a son with many challenges. But this I know, the Lord has given me a fierce, deep love for this child. A love God gave me that could be no stronger if I had given birth to him. Once Angel had been home for some time, God allowed us to see a beautiful tapestry that He had been weaving, even before I was a believer. In college, I went to become an education major with an emphasis on special education, but found out my junior year that special education was my major. This allowed me to take American Sign Language as my foreign language, with a teacher who planted seeds of Jesus in my heart. After coming to know him at age 20, He led us to Florida where I taught for three years. He then led me to work for The Florida Developmental Disabilities Council where I later became a lobbyist, and then left to lobby for children in foster and adoptive care. He had prepared me in every way to parent children with special needs. He taught me to how to educate them, how to communicate with them, and how to advocate for them. It was incredibly humbling and beautiful to see. 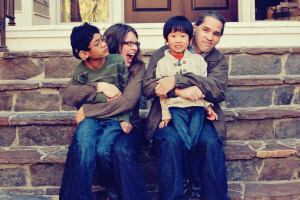 Five years after Angel came home, the Lord began to work on our hearts, preparing us for our second adoption. The circumstances were incredible…God quietly nudging each of our hearts, then putting it on a friends heart to begin our adoption fund with a little bit of seed money. Not knowing when God would call us to start the process, we patiently waited for direction. That direction came in an email from a friend on November 11, 2010. She had received an email from her agency looking for a home for a boy in China who was Deaf. She asked if we would be interested in the info, and I said yes. The next email came on November 13, 2010 with a sweet picture of one of the cutest children I have ever seen, and I thought, Fonsie will never go for this….another Deaf child? I showed him the picture, and 4 days later, after time in prayer, we committed to begin the process to bring our Xiao Yu home. This time, we did not have the money to bring a child home. With Angel’s adoption, we used the profit we made on selling our first home along with our savings. This time, we barely managed to scrape together the first $1300 we needed for the pre-approval process for China. That’s the thing with adoption…it will build and increase your trust. We knew God would provide if this is what He wanted us to do. In my heart, I knew if we received pre-approval from China, we would be adding this sweet little boy to our family; for Fonsie, he was convinced that God would indeed do this but did not know from where the money would come. In the middle of December, we got word from our agency that we had been pre-approved! I was beyond thrilled and jumped right in the car to drive to Fonsie’s work to tell him. Two days before New Years that year, a friend came knocking on our door, telling us that her father had given her a stock…and either the week we found out about Xiao Yu, or the week after, the Lord raised that stock 40% overnight, in a recession. Having just read David Platt’s “Radical”, they committed that they would give all the profit to whoever the Lord directed, and every time they prayed, the Lord told them to give it to us. That gift was $10,000. We were stunned, and knew immediately that this was the final confirmation to bring our Xiao Yu home. Throughout the entire adoption, the Lord provided over and over and over. We received checks from all over the world and even from complete strangers who learned of what God was doing. We did do some fundraising, but not much. As Fonsie likes to say, the Body of Christ brought Xiao Yu home. 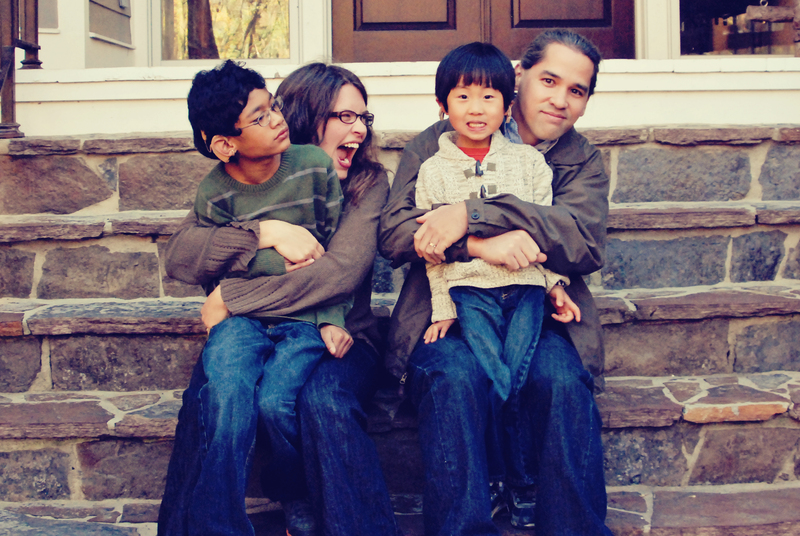 On December 12, 2011, we walked into an orphanage in Shanghai, China and met our little boy for the first time. He waddled over to us, and then we all cried. What beautiful love you see when that little one toddles to you, it gives you such a picture of how we, as sinners, toddle in our weakness to the cross throwing ourselves into the arms of Jesus, our Savior. How beautiful. Xiao Yu has been such a gift to our family, and a wonderful brother to Angel. We prayed that the Lord would knit their hearts together, and I could never have imagined how beautifully He would. I cannot imagine our family without Xiao Yu. He is a bundle of joy, love, comedy, and so many other things. I deeply love that sweet boy. Parenting our boys is not easy. It comes with many trials and with deep suffering at times. BUT, it also comes with deep joy, sanctification and love. We have seen the grace of God lived out in each of our children’s lives, and I cannot imagine my life any other way. We have learned to trust God through amazing circumstances and have firsthand seen His incredibly deep love for the fatherless. Scripture is filled with His provisions for the fatherless…it is all throughout the Old and New Testaments (Ex. 22:22; Deut. 10:18; Deut. 14:29; Deut. 24:19-21; Deut. 27:19; Psalm 82:3; Isaiah 1:17; James 1:27). So how might He use you to care for the orphan? He does not call all of us to adopt, but He does call all of us to take care of the fatherless. There are many wonderful organizations through which children can be sponsored and funds given to help families who are struggling financially to adopt. My prayer is that you will seek His Face about how you will help the fatherless. I know He will lead you as He is so very faithful. Leslie, that is beautiful. Thank you so much for sharing your story. I know the story & almost cried. Many have been blessed through you all. May the Lord guide all our journeys. Wow, it was so special to read about how your sweet family came to be. You are super special people. GOD BLESS YOU. I never tire of reading your story. Such a testimony of God’s grace and provision—-for you and your boys!